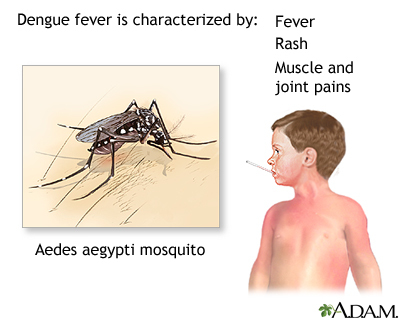 Dengue fever, or West Nile fever, is a mild viral illness transmitted by mosquitoes which causes fever, rashes and muscle and joint aches. Treatment includes rehydration and recovery is expected. A second exposure to the virus can result in Dengue hemorrhagic fever, a life-threatening illness.